women’s razors tesco Supermarket chain Tesco has cut the price of women’s disposable razors to match that of a similar product for men. The move is a victory for campaigners who demanded an end to what they saw as sexist pricing on the high street. Last year campaigners highlighted the higher price of many toiletries marketed at women compared to the lower price of similar goods for men. All of the big four supermarkets were criticised. 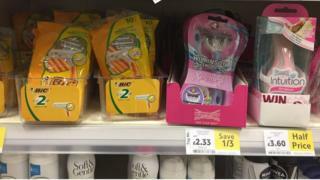 In this case, Tesco was charging twice as much for a packet of women’s razors compared with ones for men. In a letter to the Labour MP Paula Sherriff, Tesco said: “Following an internal review and discussions with our suppliers, we have acted on concerns about the difference in price of our female and male disposable twin-blade razors”. Tesco said the previous price disparity was driven by the fact that men’s razors were produced and sold in significantly higher volumes, which reduced the price it paid for them. A Tesco spokesman told the BBC: “We are guided by doing what is right for our customers and by our commitment to offering clear, competitive and transparent pricing”. A newspaper investigation last year claimed women and girls were charged, on average, 37% more for clothes, beauty products and toys. Research by the Fawcett Society in July 2016 looked at a basket of supermarket own-brand products including triple-blade disposable razors, shaving cream, spray-on antiperspirant deodorant and body spray. The Society said the “sexist pricing” for products varied widely, ranging from 22% more in Asda to 56% more in Morrisons. Last year, Boots reduced the price of “feminine” razors to bring them in line with male equivalents.